“I want you to take a good look at me,” the fragile-looking young man with a curved spine, hunched shoulders, and gangly arms addressed members of the Exide Community Advisory Committee (CAC), representatives of the Department of Toxic Substances Control (DTSC), South Coast Air Quality Management District (SCAQMD) and Department of Public Health (DPH), and concerned residents and environmental justice advocates from the communities surrounding Exide Technologies’ now-shuttered lead-acid battery recycling facility. Anthony Gutierrez had grown up in Maywood, three-quarters of a mile from the Vernon facility. Like many present at the meeting, he believed his health had suffered for it. Cancer, rotting teeth, lead-related health issues, and other ailments had rendered him so sick that the Make-A-Wish Foundation — a charity that grants wishes to children with life-threatening illnesses — had even sent him on a trip to Hawaii. 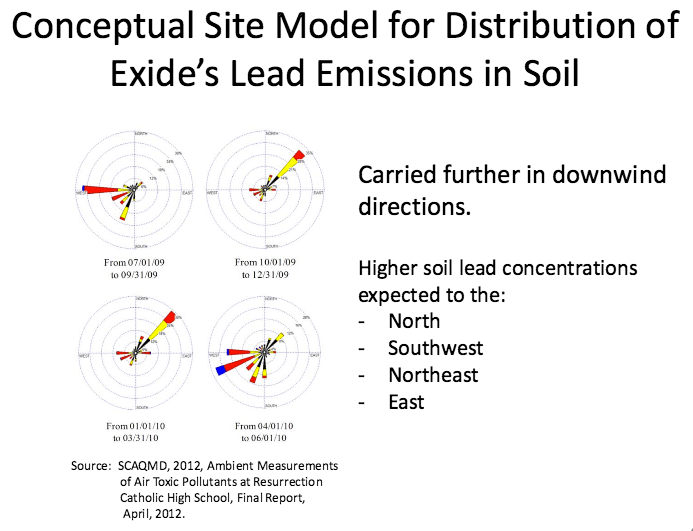 Although he, his mother, and his sister had recently moved to a one-bedroom apartment slightly farther away from Exide (but still on the northern edge of the Southern Sampling Area, seen above), new projections that lead emissions may have reached as many as 10,000 properties within a 1.3 to 1.7-mile radius around the facility meant that he still might not be safe. Noting he was recovering from a recent brain surgery, he said, “The sad part is [even though Exide has been shut down] I’m still being exposed to lead and arsenic and God knows what else,” and reiterated the need for the clean-up of lead-contaminated properties to pick up the pace. It was a sentiment shared by the overwhelming majority of the attendees at last Thursday’s CAC meeting. 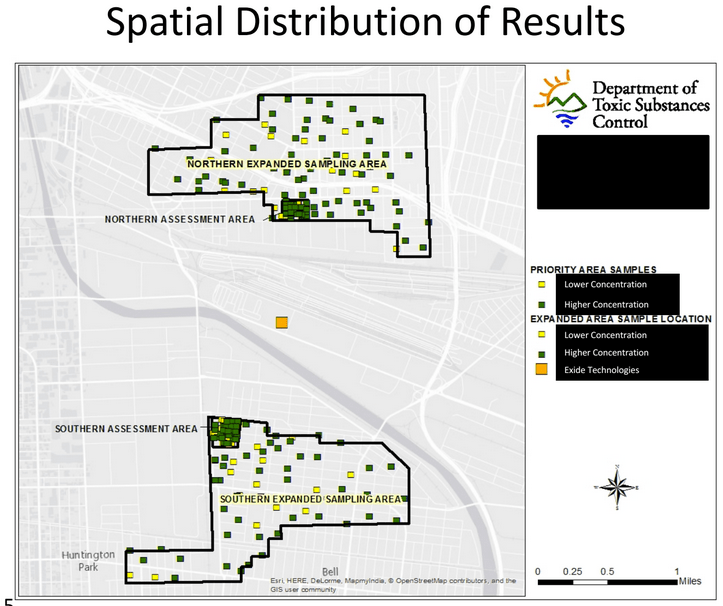 They had been alarmed, but not necessarily surprised, by DTSC’s recent announcement that preliminary results of soil testing in expanded areas north and south of the plant suggested that Exide’s emissions deposited lead dust across a much wider swath of East and Southeast Los Angeles than previously estimated. 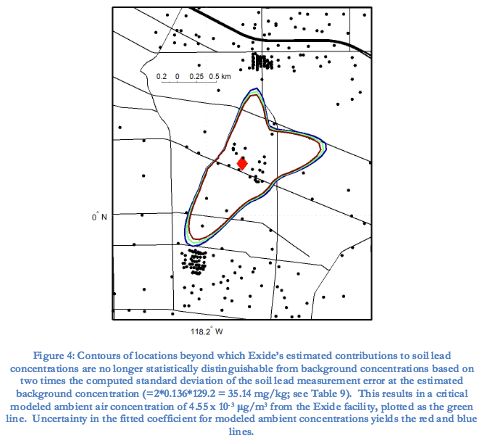 What concerned the stakeholders was whether DTSC would be able to secure the (potentially) hundreds of millions of dollars necessary to test and clean the affected homes falling within the newly-identified 1.3 to 1.7-mile radius around the facility (variable due to the prevailing winds, see illustration after the jump). The settlement reached last November initially set aside just $9 million for residential clean-ups (to be paid by Exide over five years). An additional $5 million was secured by DTSC just before Exide cut a deal with the U.S. Attorney’s Office in March, 2015, to close its facilities in exchange for avoiding criminal prosecution. Newly-confirmed DTSC director Barbara Lee told meeting attendees she had been able to secure $7 million in emergency funds from the state to dedicate to further testing (at a cost of $3 million) and clean-ups. Lee’s subsequent reassurances to attendees that DTSC would move quickly to clean up properties with significant levels of contamination represented a slight shift from DTSC’s position the week prior. At that time, on a press call, Lee had said that none of the properties tested “[met] the EPA criteria for immediate clean-up” because they did not have both high lead levels and residents in the home with lead in their blood. Community members, however, did not appear particularly reassured by this shift toward the more proactive management of potential harm. Nor were they pacified by Lee’s promise to bring a plan for further testing and clean-up in the expanded areas in September. Those with chronic health issues, tenants whose properties still hadn’t been tested for lead, and those that had already been waiting months for their own highly contaminated yards to be cleaned up wanted a concrete plan with concrete dates now, not next month. The question of lead contamination and potential lead poisoning, Bellomo said, must be understood within the underlying context. That context is one of an “EJ” (environmental justice) community — one that has disproportionately borne the consequences of poorly-regulated, harmful industrial activities for decades. And it is a context that explains the frustration, urgency, and fear for the health of their families heard in the distrust of DTSC and the calls for Governor Jerry Brown step in to oversee an environmental clean-up effort of a scale heretofore unseen in California. 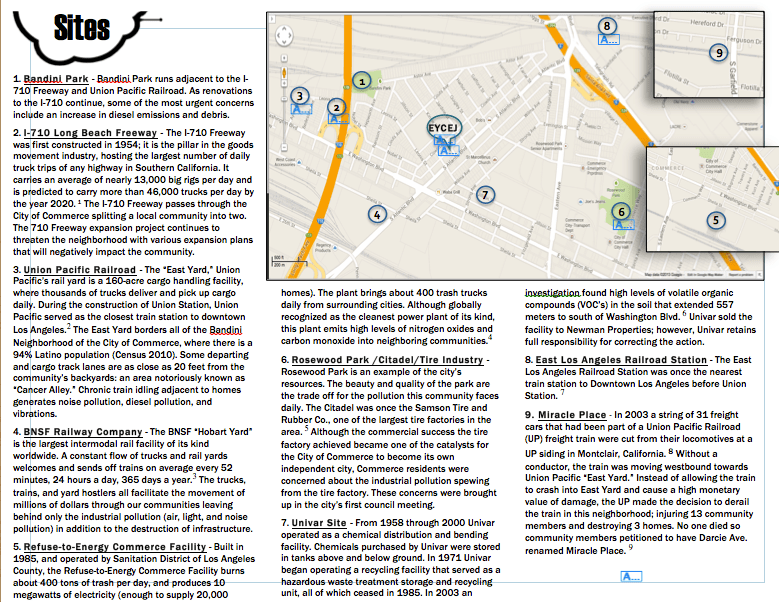 A map highlighting some of the toxic facilities surrounding the East Yards community in Commerce, just to the east of Exide’s Vernon facility. Screen shot from East Yard Communities for Environmental Justice. Click to enlarge. While the larger health battle in the East and Southeast communities does indeed entail addressing what the chronically ill Gutierrez categorized as “God knows what else,” the unfortunate reality is that, at the moment, the battle to hold Exide accountable hinges primarily on lead. And it is a battle Lee said she expected to be very hard-fought. 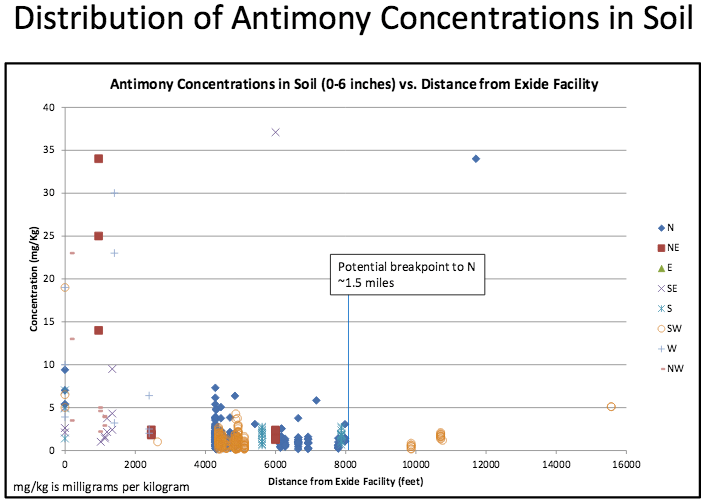 The day before DTSC released its preliminary findings suggesting that the pattern of lead concentrations (decreasing as one moved farther from the recycling facility while remaining above expected background levels) and the presence of antimony (commonly used as an alloy material in lead-acid batteries) linked the contamination to Exide, Exide released its own report. Graphic from the report produced by Drs. Small and Rose on behalf of Exide. 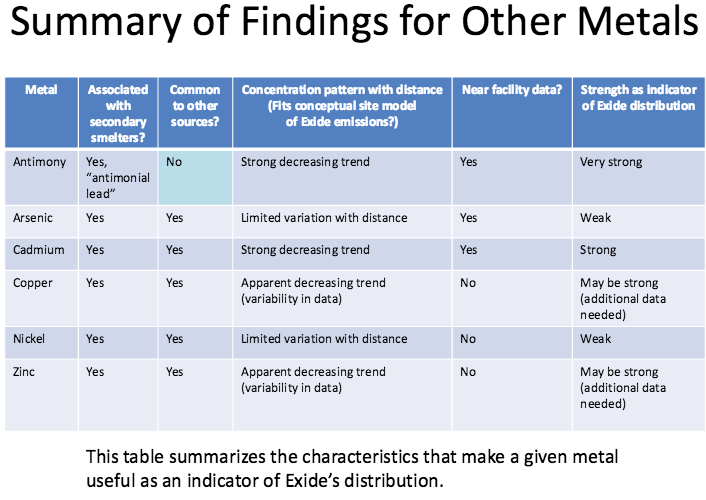 DTSC’s researchers are still reviewing the Exide-commissioned report, and would not comment on it as of this writing. 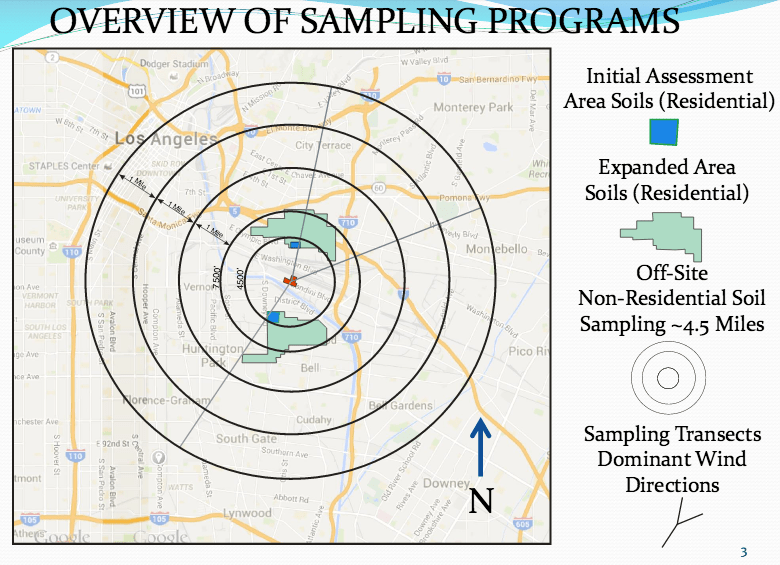 But, at last Thursday’s meeting, DTSC did seem confident that their preliminary study was on the right track, even as they acknowledged the need to conduct further sampling where the sample sizes had been too small or the results had been inconclusive. And they made clear that more testing — despite being seen as a waste of time and money by some of the community members — was of the essence if DTSC was going to be able to hold Exide accountable for the costs of the clean-up. As of now, establishing the presence of antimony (and possibly cadmium) appears be one of the most promising avenues for doing so. But it also appears to be a difficult path to pursue. The secondary smelters used by Exide to extract the lead from lead-acid batteries did not rely on a uniform source of material. So, finding a reliably consistent footprint of metals may be a challenge, especially if some tend to travel shorter distances than others when airborne (arsenic, for example, has not traveled as far as lead did). And some of the other metals commonly associated with secondary smelting — copper, zinc, arsenic, nickel, etc. — are harder to attribute exclusively to Exide (above). Even antimony is an imperfect marker (thus far in the process), appearing in the greatest concentration to the north of the plant, at a range of up to approximately 1.5 miles, and appearing in far lesser concentrations in other directions and at farther distances. While Lee seemed confident that they would be able to attribute a significant level of contamination to Exide, she also acknowledged that there were other potential sources of lead contamination. And for that reason, she said, she was dedicated to both identifying others who might bear responsibility for that contamination and working with a variety of state agencies to leverage the resources necessary to ensure that all contaminated properties could be cleaned up, regardless of who was responsible. Still concerned about the availability of funds for the residential clean-ups, community member Miguel Alfaro told Lee to abandon the costly effort to dismantle and clean up Exide’s toxin-laden facilities and to focus instead on the residences. While leaving the plant intact might not be a viable solution, Alfaro was certainly right to be concerned about what is actually happening with the plant. Documents on DTSC’s Exide-specific page indicate that things are not going all that smoothly with regard to the closure process. This is not surprising, considering that concerns about the ability of Exide to pull together a satisfactory Closure Plan or set aside sufficient funds to ensure that a closure could be handled properly were behind DTSC’s intention to deny Exide’s third and final application for a formal operating permit this past spring. But it is disheartening to see 82 pages of comments on Exide’s draft Closure Plan, submitted in May of 2015, and realize how little effort Exide has made to handle things properly. Attacks on the corporation’s carelessness and inattention to detail feature prominently in the weighty Notice of Deficiency issued this past June. Exide is slammed for not having a proper Executive Summary, not knowing which regulations it was being asked to act in accordance with (and which ones were non-existent), not seeming to know it had to adhere to closure performance standards (not just meet clean-up levels), not creating plans for the movement of slag, the dismantling of the Finished Lead Building, or for assessing/removing the soil contamination once particular sites were dismantled, and not having “any discussion on oversight for closure activities at the facility….an organizational plan for who will provide oversight [or] how oversight will be conducted.” And those were the comments from just one senior engineer in the Hazardous Waste Management Program at DTSC. The comments that followed from other specialists within DTSC continued to harp on Exide’s lack of attention to the methods it would use to clean up contaminated elements of the facility or address ongoing issues, like leaks of contaminated water, for example. Exide apparently also received a host of critiques from the AQMD in June (in addition to being hit with a third amended complaint in a lawsuit by the AQMD seeking a total of $80 million in damages for transporting lead chips from leaky trucks), and did not submit a revised draft Closure Plan until July 28. DTSC is reviewing that draft plan now. All of which means that expectations that the first phase of the closure of the plant would be completed by May of 2018 or earlier may need to be recalibrated. DTSC now estimates that the first phase — the final removal of the inventory, demolition of the buildings, disposal of the structures, and decontamination — will begin next spring and be completed in the summer of 2019 (Exide’s revised Closure Plan, in contrast, suggests that Phase I will take 5.75 years). Phase II, entailing the sampling and clean-up of the soil and groundwater beneath the site, was projected to be finished in June of 2020 but may also be delayed by a year or more. And Phase III, listed in an AQMD document as “ongoing” long-term closure, inspection, monitoring, and maintenance activities at the site, may continue until 2049 or beyond. Considering that extended timeline, it seems safe to assume that simply leaving Exide as a monument to lax regulation would probably only hurt the surrounding communities and any future generations in the long run. In emailed communication received from DTSC regarding the Closure Plan, DTSC states that they will bring the draft Closure Plan to the community to ensure they hear any outstanding concerns regarding the impact of the closure on human health. DTSC anticipates asking for that input in October. See the weekly reports on Exide’s closure activities filed by Tetra Tech at the AQMD’s website, here. Keep up with DTSC’s status reports on clean-ups, meetings, the Closure Plan, and other information, here. See Exide’s own findings regarding its lead footprint, here. 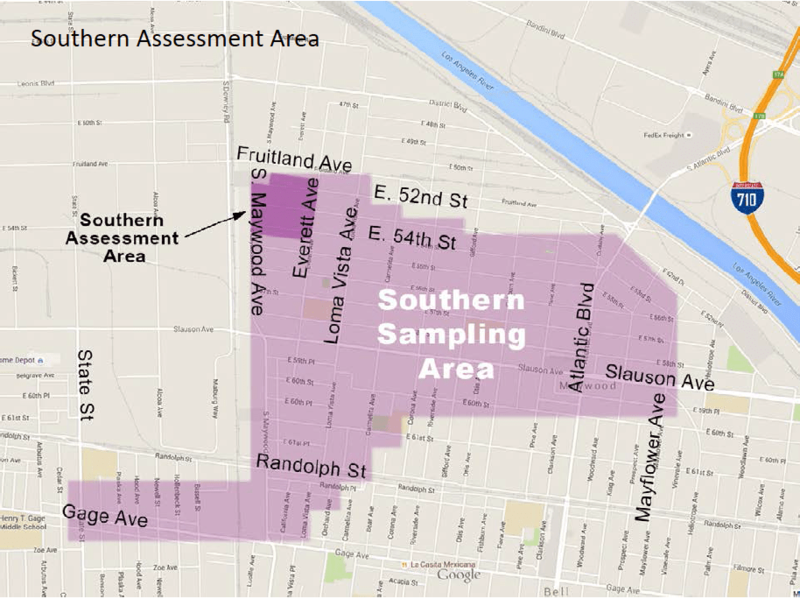 See DTSC’s preliminary findings report, here, and an overview of how DTSC’s sampling was conducted, here.